Kids In Charge Breakfast Clubs give children the best start to the day. Children are greeted by a regular staff team, variety of activities and food options. There is always a warm bright welcome for parents and staff . Our staff build relationships with the children to get to know their likes and dislikes and communicate with them about their school day, issues they may be having with peers and what they’re looking forward to for the day at school ahead. Calming music is played to enhance the sense of calm. Each club has its own Supervisor who will direct the activities and plan for the children’s needs. The supervisor will communicate with you around any needs you may have. Fresh fruit is served daily and children have the opportunity to enjoy a new taste throughout the month such as papaya, mangos and raisins. Various dietary needs can be supported and religious food preferences are catered for. Our breakfast clubs also offers a range of games and educational activities that we encourage the children to join in. The resources on offer are chosen with the needs of children in mind. Each morning is planned with activities as is the food. Staff take the time to prepare the children for their day through discussion and group activities. Staff sit at the table with children to eat breakfast and support conversation. Young children from age 3 are welcome and soon settle in due to routines. Our staff are on hand to play games and we ensure your child arrives in class calm and happy and ready to learn. We also provide a quiet space for children to do their homework. During the first term of school there are morning routines that schools have Reception and Nursery children complete such as finding their name on the pegs and finding their name for the register. Young children who are 3-4 years are in Reception and Nursery are supported with their morning settling in routine by staff during the first term so parents do not need to worry about this. If your child is finding it difficult to settle into their class Kids In Charge staff will stay for the first 5 to 10 mins to support this process also. Many of our staff work at both Breakfast and Afterschool clubs and this allows for a continuity of care. Bookings can be made for various booking patterns shift work patterns can also be catered for. We require a two day booking as a minimum. 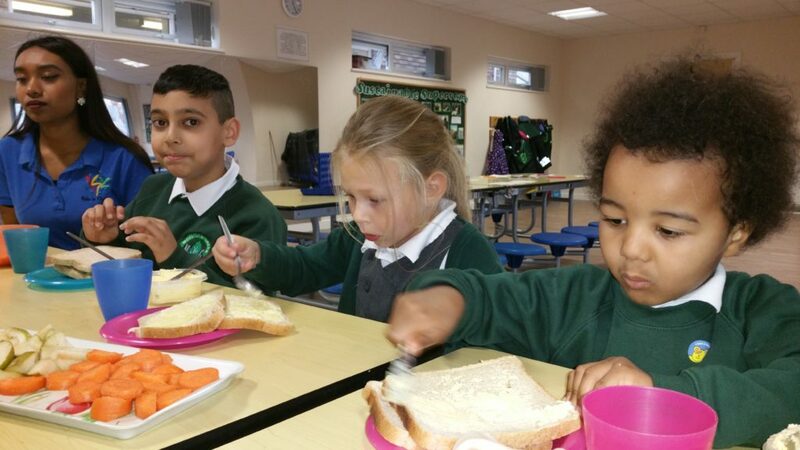 Our Nursery Rightstart Daycare at Horns Road Ilford provides a breakfast club with drop off to local schools the schools we take children to are Newbury Park School, Gearies Primary School and St Augustine School. Children are walked to school wearing Hi-visibility jackets.